Ask fellow campers about "Zion Canyon Campground & RV Park" and nearby attractions. Basically a dirt parking lot with hookups. Restrooms and showers were clean. Sites packed quite close together. Only reason to stay here is proximity to the park entrance and the shuttle stop right outside the park. We camped at Zion Canyon Campground & RV Park in a Travel Trailer. Zion National Park of course. Do some of the hikes. Town of Springdale is pleasant with plenty of visitor services. Very ordinary campground--tight spaces, tight turns, non existent wifi. That's the bad part. The good part--fabulous scenery, walking distance from park entrance, and Zion Brewery close to park entrance. We camped at Zion Canyon Campground & RV Park in a Travel Trailer. We had a fairly level, gravel, FHU site with cable TV. The site was satellite friendly. Most sites are tight. The park was almost full so the Wi-Fi was barely good enough to check e-mail and the bathroom facilities were not clean. I did not see any recycling. We camped at Zion Canyon Campground & RV Park in a Motorhome. Extremely close to NP entrance via free shuttle or walk. Park sites are very close together and WiFi is almost nonexistent. We had a full hookup site near Virgin River. Very dusty so be prepared for red dust everywhere. Town of Springdale very nice. I wouldn't want to drive any coach bigger than a 38' at this park. We camped at Zion Canyon Campground & RV Park in a Motorhome. Cafe Soleil and Oscars to eat. We enjoyed our stay. Had gorgeous views from the campground all around. Colors w changing position of the sun were incredible. Just a short distance from the Visitor's Center of Zion National Park. Can walk or take the free shuttle which stops right outside the campground. Also easy walking distance to shops, galleries & restaurants of Springdale. Campground gets to use the pool of the adjacent Quality Inn. Only negative was the early morning motorcycle sounds from the nearby parking lot. Quiet period until 9am would be appreciated. We camped at Zion Canyon Campground & RV Park in a Motorhome. Close to Zion NP entrance, access to Virgin River. Private shower rooms at one bath house. We camped at Zion Canyon Campground & RV Park in a Travel Trailer. This park cheaped out by putting electric and water at every other site. You have your own hook up, but you are front door to front door to your neighbor which is awkward. The sites are so small you and your neighbor have a picnic table and fire ring within 5 feet of each other. Weird layout. We arrived Sunday and the dumpsters were overflowing and we could smell it 4 rows away. We camped at Zion Canyon Campground & RV Park in a Motorhome. Take The Narrows hike. And definitely rent the gear. Rate is base (RV and 2 people) plus fees for one additional adult and one child. Park is in an amazing location! Scenery is spectacular. Conveniently located walking distance to the entrance of Zion National Park and the town of Springdale. Only one negative: need more hooks in the showers (there is only one in each shower). This park is a definite thumbs up. We camped at Zion Canyon Campground & RV Park in a Motorhome. The best thing about Zion Canyon Campground is its location. It is very close to Zion National Park and there is a shuttle stop right there. The view is beautiful - you're looking up at beautiful mountains from your site. We had a very good stay and we would happily stay here again. We camped at Zion Canyon Campground & RV Park in a Motorhome. Beautiful campground 1/2 mile from entrance of Zion. Next to the river and surrounded by the mountains. Convenient to shops, restaurants and groceries. Level site and shade trees. Would stay there again. 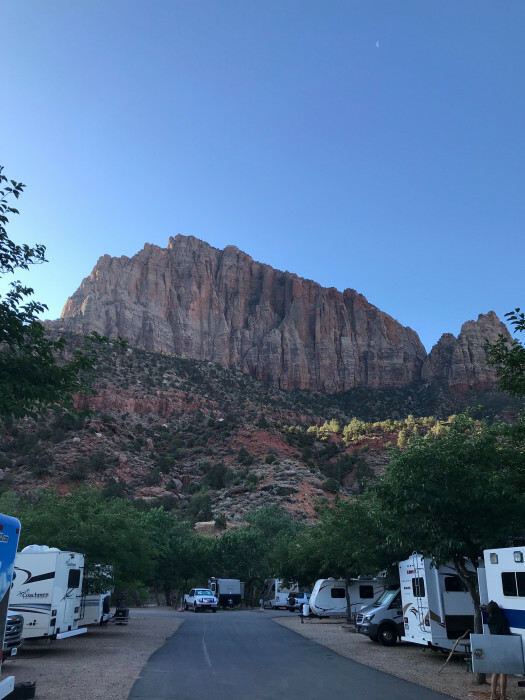 We camped at Zion Canyon Campground & RV Park in a Motorhome. Nice wash station by the showers. 1 shower token is included with each night stay. Shower last 6 minutes and additional tokens are $5. My wife used mine and the front desk girl happily gave me one extra. There is a fire pit and picnic table. Close walk to front gate, and shuttle stop right out front if you are tired after hiking. Firewood at $6.24 a bundle was reasonable. Dogs permitted and plenty of people around with dogs. Liquor store at opposite end of town in a gift shop. Would definitely stay here again. We camped at Zion Canyon Campground & RV Park in a Travel Trailer. Coffee shop on walk to front gate is great. We have a 40 foot fifth wheel and wanted a full hookup site. We had to go to a store across the road, pay, and they gave us a map to our site - this is the only way to pay/check-in. The RV sites had full hookups but we're totally unkept. The weeds and dry brush outside our rig had thorns that stuck to our clothes and the dog's feet. The only place there were no weeds was in the roadway. We spent two nights at the park and we did not see one person who was maintaining the park. There was toilet tissue around the water spigot at our site. This is the most(rustic) RV park I have ever tried. Never again. Use another RV park if you have the option. This was the only one available when we made reservation two weeks in advance. 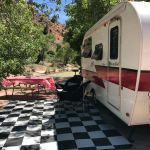 We camped at Zion Canyon Campground & RV Park in a Fifth Wheel. We were here 5 years ago and realize that this park is only worth it for the location right next to Zion NP. We had a FHU, pull through site with cable TV. The park was fairly full so the Wi-fi was almost non-existent. This crowds also kept the bathrooms dirty for our entire stay. Only the location makes this park worth staying at for $50/night. 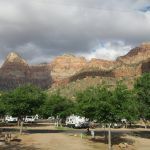 We camped at Zion Canyon Campground & RV Park in a Motorhome. Loved this park, the ambiance, the location and the chill environment. There are places to walk pets. Will definitely stay again! 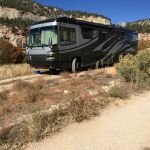 We camped at Zion Canyon Campground & RV Park in a Fifth Wheel. We spent two nights here. We had a site on the river. But it was that red powdery dirt. The sites are very close together, but ours was level. It was barely long enough for our 32' DP. There is a great transit service in and out of the park that stops at the entrance of the campground. We had a gorgeous view of the Watchman at sunset. They didn't assign our site until arrival, but we were traveling with friends, and they did put us next to each other. 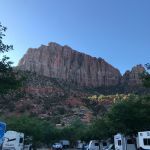 We camped at Zion Canyon Campground & RV Park in a Motorhome. Note that ONLY SERVICE DOGS are allowed on the free Zion shuttle. Also, only the shuttle is allowed up the main Canyon road. You may drive your car/rig thru the park, on Route 9 and proceed thru the Mt. Carmel Tunnel to the east side of the park (heading to Bryce Canyon & Capitol Reef. Be aware, there is an additional fee and limitations on size thru the tunnel. Be sure to drive over to Kolob Canyons (about 45 minutes away); its on the far side of Zion and the views/hikes are wonderful. Close to town (shops/restaurants) and national park. Easy walk through town. Lots of shops and restaurants. Narrows equipment rentals were across the street from the campground, again, no need to move your vehicle. Mountain biking 20 minutes away in Virgin. Zion Natl park, hiking. Great walk to the bus stops in the park. Easy walk in entrance that takes less time than driving. A national park pass is well worth the money. We found Oscar's best for dinner but portions are huge! Order half as much as usual (nachos outstanding). Switchback steakhouse overpriced but there is a wine/liquor store there. Wildcat Willy's family dining good for breakfast/lunch but be ready to wait 20-30 mins min. Sol Foods has most any grocery you need and good public wifi. All but Switchback are within 1/2 mile of campground - very walkable. I recommend stopping at the Walmart in Hurricane to buy your water jugs, meat, and produce. The one grocery store, Sol Foods, is great but pricey. Lots of great dining options are nearby. We ate at the spotted dog cafe with our doggie. Nice! The market is across the street and has most things you need. There is an adventure hiking company as well. Springdale a great little town you can walk to from RV Park..great places to eat and shop. Zion is great and this is second best to the park itself. We will always be back. Take the shuttle to Zion Park entry. If you choose not to cook yourself, take the shuttle to the city centre, lots of restaurants there. Last shuttle at 8.30 pm. The entrance to Zion National Park is only .4 miles away, within walking distance. The town of Springdale is very touristy in an upscale way. There are plenty of restaurants, shops and galleries to keep you amused if you run out of things to do in the national park. Groceries at Sol Foods were good and reasonably priced. Good eats at Spotted Dog cafe (dinner) and Whiptail Grill (lunch). Take the Zion Canyon Narrows hike if you are capable of walking 4 miles or more on an easy grade round trip. Just getting to the river is wonderful...and you can hike up river...in the river... for as little or as long as you like. Bring hiking stick...spectacular. Shuttle will bring you to start of trail. Spotted Dog restaurant is excellent. Grocery store in town had good selection and reasonable prices. The Zion National Park shuttles are free, as is parking in town. Lost to do in the Zion Canyon park, especially if you like to hike steep inclines. The park is located about one mile from the entrance to Zion National Park. Restaurants are located within walking distance and the park's shuttle service stops right by the entrance to the campground. Are you affiliated with Zion Canyon Campground & RV Park ?